Heat oven to 450°F. Unroll 1 crust in ungreased 9-inch glass pie plate. Press crust firmly against side and bottom. Trim along edge. Set aside. Unroll 1 crust on work surface. 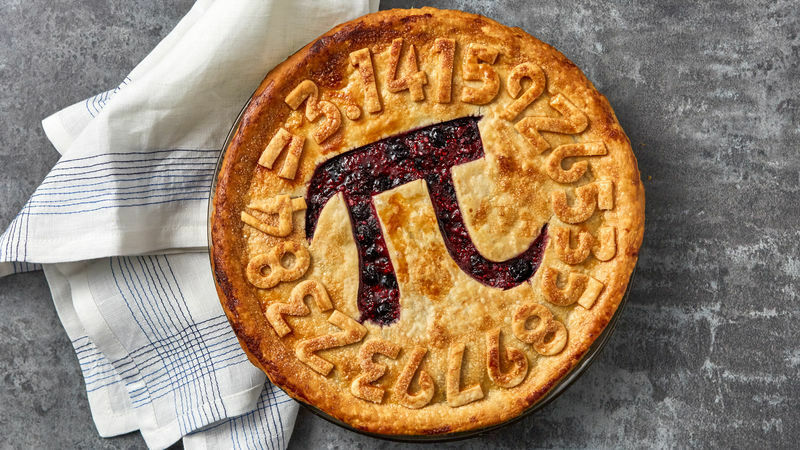 Using small number-shaped cutters, cut out numerals representing pi to as many digits as desired (for example, 3.14159265). Set aside. In large bowl, stir together 1 cup sugar, the cornstarch, tapioca and salt; gently toss with berries. Let stand 15 minutes. Spoon into crust-lined pie plate. Unroll 1 crust on work surface. Using small sharp knife, cut pi symbol in center of crust. Place crust over filling. Wrap excess top crust under bottom crust edge. Press edges together to seal; flute. Brush crust with milk; arrange numerals around edge of crust. Sprinkle crust with 2 teaspoons sugar. Place pie on middle oven rack; place large cookie sheet on rack below pie plate in case of spillover. Bake 15 minutes. Reduce oven temperature to 375°F. Cover edge of crust with strips of foil to prevent excessive browning. Bake 40 to 45 minutes longer or until crust is golden brown and filling is bubbly. Let stand 2 hours before serving. Feel free to play around with the combination of berries to suit your taste preferences.